Bejeweled is an extremely popular online slot that proved to be such as smash hit since it launched in 2001 as a PopCap video game that it spawned two sequels. The original slot by Blueprint Gaming has since been phased out and replaced by its predecessor, Bejeweled 2 Slots, which is even more dazzling and immersive and features more modern, high-quality graphics. Bejeweled 2 Slot is a five-reel slot from Cryptologic with twenty adjustable paylines and three rows of symbols, and you can play it with as little as 1p and as much as £500 per spin. At the bottom of Bejeweled 2 slot game’s screen, there are Stake/Line settings which let you adjust your wager per payline from £0.01 up to £25.00, and Lines settings which allow you to alter the number of paylines you wish to play with. There’s also a big, pink Spin button, and blue and red buttons that let you set up Autoplay or view the Paytable respectively. You can create winning combinations from left-to-right across the reels using the three coloured gemstones (the ruby, the sapphire, and the emerald), any of the five playing card symbols, or the spinning wild. The wild can substitute for any paytable symbol except the three scatters and as it also boasts a x2 multiplier, it doubles the value of any wins it creates. The three scatter symbols that are included in the Bejeweled 2 slot, and each of them has the potential to trigger its own special bonus feature. 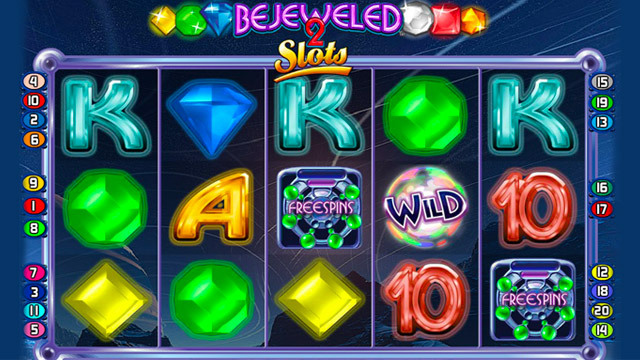 The symbol that includes a five-by-five gemstone grid activates the main Bejeweled 2 slot Bonus when it lands anywhere on the reels three, four, or five times in the same spin. This gives you the pleasure of playing a traditional game of Bejeweled where you need to match three or more consecutive gems either vertically or horizontally to win a cash prize. After every win, the gems featured in the winning combination explode, allowing new ones to drop into the vacant positions and potentially create additional wins until no more can be formed. Three, four, or five Free Spins symbols awards you fifteen, twenty-five, or fifty free games respectively. Before the bonus starts, you get to spin a Multiplier Wheel to determine whether any wins will benefit from a x2, x3, x4, x5, x6, or x7 multiplier. The “Bonus” scatter symbol triggers the Wheel of Riches Bonus game whenever it lands three or more times on the same spin. The silver-and-purple disc that represents this scatter then starts to spin before slowing down and stopping on a multiplier of up to x500, which is applied to your total bet. If you’re a fan of the original game, we’ve no doubt here at Offersville that you will also love the newer Bejeweled 2 Slots game.